The two works recorded here come from different periods in Dvořák's career. In the String Quintet in G he dispenses with a second viola, instead placing a double bass beneath the single cello, but textural richness is not the composer's aim: one can listen to passages of the work without sensing any pointed differences from quartet texture. Similarly, the success of the Piano Quintet in A rests on its happy reconciliation of forces. Dvořák's early attempts at composing for the piano had been hampered by his own lack of familiarity with the instrument, but in this work he achieves a remarkable fluency, with five instruments operating as consistent equals and in harmonious unity and balance. ‘Some are born great, some achieve greatness, and some have greatness thrust upon them.’ The hapless Malvolio might have believed himself in the third category, but if we were to attempt assessment of composers in these terms it is probable that most would be casually placed in the first, while closer knowledge of those concerned would have rendered the second more truthful still. ‘Simplify me when I’m dead’, wrote the Second World War poet Keith Douglas; and it is in that spirit that we too readily attach our preconceptions of innate greatness to the finished careers of any whom posterity has remembered kindly. Even a Bach or a Beet­hoven is born with no more than the seeds of great­ness to come, and if we take time to delve deeper into the lives of artists we may be surprised at the unlauded years of obscure drudgery preceding the known inspirations and rewards. In this connection few names could have seemed more innocent of all early associations with creative genius than that of Antonín Dvorák. The eldest of eight children, Antonín was born on 8 September 1841 in the village of Nelahozeves (known also as Mühlhausen while the Hapsburg regime endured), some twenty-eight miles north of Prague. His father Frantisek was an innkeeper and butcher, and his mother Anna had been in service at the nearby castle of Prince Lobkowicz. Bohemia, which had remained in thrall to the Haps­burg dynasty ever since the outbreak of the Thirty Years’ War in 1618, was enjoying a period of particular buoyancy and optimism towards the middle of the nineteenth cen­tury, and its villages had in any case remained largely untouched by political and cultural oppression. Catholic observance of feasts in the church year therefore encouraged frequent manifestations of the region’s secular musical tradition, since in the villagers’ eyes the one inevitably led on from the other. This was to prove crucial to the mature Dvorák’s development along ‘nationalistic’ lines. The young Antonín was receiving violin lessons from Josef Spitz at the village school before he was ten, but little is known of his initial progress. As German was the official Hapsburg tongue, an inability to speak it constituted a significant career disadvantage, and accordingly Antonín was sent in 1853 to Zlonice, a town four hours west of Nelahozeves, where he lodged with his maternal uncle and received both linguistic and musical instruction from Antonín Liehmann, an able amateur musician and local organist. German appears to have been neglected in favour of harmony, figured bass, piano, organ, violin and, particu­larly, the viola, which was to remain the adult composer’s favourite instrument. In 1855 his family followed him to Zlonice and his failings in German were rewarded by a spell at the Ceská Kamenice (Kamnitz Academy) in the mountains of North Bohemia. Here he deputized for Franz Hancke, an organist who had earlier graduated from the Prague Organ School. After Antonín’s return Liehmann’s attempt to have him study at Prague himself was at first opposed by the elder Dvorák on very reasonable financial grounds, but he relen­ted and Antonín joined the Organ School in September 1857. A year later the Principal, Karl Pitsch, died suddenly and was replaced by Josef Krejcí. This was a mixed blessing: Krejcí was a compatriot of Dvorák’s, but pro-German and anti-nationalist in his tastes (though also an admirer of Liszt and blower-away of some of the academic cobwebs woven by Pitsch). By now Dvorák was active as an orchestral violist. Participation in the orchestra of the St Cecilia Society (con­duc­ted by Antonín Apt, an able amateur of enlightened tastes) afforded the future composer his first experience of Wagner, whose impact may be discerned to an almost uncomfortable degree in Dvorák’s first four symphonies. Dvorák soon joined what was to become the nucleus of the Czech Opera Orchestra. At this early stage it was active principally in major restaurants where it purveyed pot-pourris and overtures. Its subsequent importance in the hands of Smetana can hardly have been foreseen by the younger composer. His father was in dire straits, an allowance from his uncle had ceased, he possessed no piano, and he could afford neither manuscript paper nor scores. Although he emerged second out of twelve from his second year at the Organ School (behind one Siegmund Glanz, whom posterity expeditiously buried thereafter) his report stated that ‘practical knowledge and skill’ seemed to be his preoccupation, with an implied and belittling emphasis on ‘practical’. ‘In theory he is weak’, the writer concluded dismissively. Thus the figure whom we contemplate in the closing months of 1859 is that of an eighteen-year-old without visible means of support, regarded as deficient in technical aspects of composition and with virtually no apprentice­ship, springing from self-determining effort and experi­mentation. At this juncture Dvorák was very far from having greatness thrust upon him and his prospects must surely have deterred anyone of a less dogged and tenacious temperament. Between 1859 and 1871 he was to follow an intensive and unremitting process of self-discipline, self-education and characteristically secretive hard work. Taking the Classical masters as his models and starting again and again from scratch with the persistence of Robert Bruce’s spider, Dvorák wrote huge quantities of music solely as a means to a higher end. Even had there been any certainty of light at the end of the tunnel, this would stand as a formidable achievement in its way. As it was, not only was there no such alleviation, but the fledg­ling composer actually ensured the lasting indifference of later generations to these twelve years by burning almost everything as soon as it had fulfilled its short-term purpose by propelling him on to the next stage of his creative evolution. Only intimates were later made aware of this state of affairs. Even some works which did survive may have been saved only by chance: for example, the com­poser’s First Symphony in C minor (‘The Bells of Zlonice’, written in February/March 1865) vanished after he had unsuccessfully submitted it to a competition jury, evidently having rated it higher than his other work to date. He appears to have cared little about its failure to return; had it done so it would have probably have been greeted with a lighted match. As it is, it reappeared unexpectedly in 1923. Having already been smitten by Wagner, Dvorák could be expected to have moved in the direction of opera during his long occupancy of a compositional ivory tower. That he did not, preferring to take Beethoven and Schubert as his principal models, says much for his pragmatism and sober self-assessment (suggested also by his secrecy: few of his friends were aware of either his long-term ambition or of its pursuit behind closed doors). Clearly Dvorák had a vision of what he needed to do to lay dependable foun­dations for his compositional development. As it is, certain works which do survive prefigure much later ones in the same media. Opus 1 is a String Quintet in A minor, dated 6 June 1861 and evincing little if any nationalist sentiment. There are also an early Cello Concerto in A major (another work whose escape from the flames may be purely fortuitous) and a Piano Quintet in the same key, Opus 5, written in August 1872. This was one of the first of Dvorák’s works to receive a prestigious première after his emergence as a composer. It seems likely that the other Piano Quintet in A, Opus 81, arose from dissatisfaction with Opus 5 and a wish to contribute a fully mature work to a medium in which he felt he had yet to succeed. The keys A major and A minor attracted Dvorák throughout his compositional career and the exis­tence of two piano quintets in A major causes occasional confusion, exacerbated by a quite separate muddle sur­rounding his opus numbers. This latter affects the String Quintet in G major, heard here, and accordingly requires elucidation. From late 1877, when Dvorák became associated with the Berlin publisher Simrock, a somewhat uneasy com­mercial relationship existed. Simrock frequently pressed the composer for what he himself saw as marketable material, sometimes managing to imply none too tactfully that large-scale works were a liability by virtue of the time taken creating them and questionable demand for the finished product. At times Dvorák was thus prompted to exhume earlier, unpublished but saleable work for Simrock in order to appease him on both counts. His increasing prestige seems to have caused Simrock to act out of pique at moments when the publisher could no longer (literally) call the tune. It may be for that reason that Simrock intermittently embarrassed Dvorák by simply labelling a newly received early work with the next number in his publishing sequence, thereby seeming to disclose sudden stylistic regression on the part of a mature and distinguished composer. In the case of Dvorák’s sym­phonies the problem outstretches the personal agency of Simrock on account of disappearances and/or post­humous publications (Symphonies 3 and 4 were not pub­lished until 1912; No 1 has been mentioned). However, even Symphonies 5 to 9 (mature works subject to neither suppression nor loss) were provided with some extra confusion when Simrock published the Sixth as ‘No 1’, the Seventh as ‘No 2’ and the Fifth as ‘No 3’. The effect of Simrock on the G major String Quintet will be mentioned later. In the meantime, Dvorák’s years of creative isolation had not been without momentous incident in the world outside. Since October 1856 the composer Bedrich Smetana (1824–84) had occupied a teaching and conducting post in Gothenberg at the invitation of the Swedish musical establishment (the redemption of whose ‘antediluvian taste’ he was much relishing). Already a mature composer, he was under the powerful and progressive influence of Liszt (an earlier mentor), as is seen in the three sym­phonic poems which he completed in Sweden. Elsewhere, Italian military victories over Austria had somewhat loosened the Hapsburg grasp. In the prevailing political emancipation a remarkable resurgence of Czech culture was beginning. Lured by this, Smetana returned to Prague in May 1861. In many respects Smetana’s early life mirrored Dvorák’s. He had studied the piano and the violin (though unlike Dvorák he had become a pianist of the Lisztian virtuoso order); he had weathered paternal opposition; he had been sent away to Pilsen to study German, which he had neglected; and, overcoming paternal resistance, he had gone to Prague as a student virtually penniless. When Smetana returned to Prague from Gothenberg he had recently endured the death of his first wife and of three of his four daughters in infancy. (Curiously the death of his eldest daughter had led to the anguished outpouring of his Piano Trio in G minor in 1855; twenty years later the loss of Dvorák’s first-born, Josefa, was also to find expres­sion in a piano trio in the same key.) Remarried in July 1860, Smetana was looking only forward as he threw himself into virtually every aspect of the musical life of Prague. A Czech union of singers was formed under the title ‘Hlahol’ (‘Sound’) and Smetana helped to found the musicians’ branch of the ‘Umelecká Beseda’ (Artists’ League). In 1862 a temporary theatre opened, and the prior existence of the Czech Opera Orchestra made sym­phony concerts a realistic proposition. Smetana became conductor of the Opera Orchestra in 1866, the year in which for the first time he had shown his true nationalist colours with The Bartered Bride (Prodaná Nevesta). This opera was predestined for success; the Czechs had already taken The Marriage of Figaro to their hearts, adopting many of Mozart’s melodies as popular songs, and Smetana’s new work stood comparison with ‘Figaro’ in ways going beyond similarities of plot. Watching from his seat among the violas of the Opera Orchestra was Dvorák. He had yet to catch the attention of Smetana, but his patient industry was coinciding most propitiously with a remarkable period in the artistic life of his homeland. The student who had so little going for him in 1859 could hardly have prophezied such a timely conjunction of personal and national good fortune. In 1871, three years after its appearance, Die Meister­singer von Nürnberg received a performance at the German Provincial Theatre in Prague. Wagner’s influence, which had rather oddly overflowed into Dvorák’s non-operatic ambitions, was strengthened by this and by the experience of hearing Liszt performing his virtuoso Wagner piano transcriptions. The Wagnerian impulse can be detected in the String Quartets, Opp 9 and 10, which Dvorák produced in 1870, and which Alec Robertson (Dvorák; Master Musicians, J M Dent, 1945) intriguingly considered ‘more like stage than chamber music’. Clearly opera was to come. However, despite the much later culmination of this in the triumphant masterpiece Rusalka (March 1901), Dvorák’s early efforts were hampered by defective choice of libretti and their authors. By now Smetana was taking notice: under his baton the overture to a comic opera by Dvorák was performed, but the National Opera declined to stage the whole work. One must speculate that Smetana’s assistance may have been much inhibited by his junior colleague’s congenital secrecy. Dvorák seems to have admired and learnt from Smetana without thinking ever to exploit the relationship in ways which to others might have seemed no more than common sense. Critical notices were now appearing. Ludevít Procházka (1837–88), editor of a music journal, blew hot and cold, taking an encouraging interest but justly criticizing the early Piano Quintet’s lack of formal control and what he considered a vulgar use of national dance characteristics. Despite the presence of the latter, this work had not achieved the composer’s later expressive freedom in the reconciliation of national and academic elements. Harking back to the Organ School’s comment on his ‘weak’ theory, one should perhaps see in it and in Procházka’s remarks a certain irony: although Classicism was the means to Dvorák’s mature creative ends, what it gave him was the broad-based assurance to cast off in his own direction. Where he most succeeded later in his nationalistic vein, it was by a form of ‘acquired instinct’ and wisdom which allowed the non-academic elements of his art to dictate forms (but not formlessness) of their own. Given his habi­tual pyromania in the 1860s he may always have exercised a conscious hope of this without seeing then how it might be done. Procházka’s criticism pales beside a virtuoso display of vitriol by the composer Hugo Wolf, who in 1885 was resoundingly to dismiss Dvorák’s opera Selma Sedlák as ‘revolting, brutal and trite’. Wolf’s antipathy has roots in an association which Dvorák had formed by then and which was to prove the turning point of his career. In one of its more philanthropic moments the Haps­burg regime had inaugurated a state grant for ‘young, poor and talented painters, sculptors, and musicians in the Austrian half of the Empire’. This included Dvorák and he accordingly submitted an application to Vienna in 1874, sending fifteen compositions. These included the Third and Fourth Symphonies, the former of which had been performed under Smetana the previous March, receiving indifferent notices. It is probable that he sent also Hymnus, a patriotic cantata which in March 1873 had provided his only public triumph thus far. He had married Anna Cermáková, an accomplished contralto, in Novem­ber 1873 and the couple were now living in their own home, Dvorák having also found a church position less onerous than that upon which he had been largely dependent. Procházka was by now prophezying national success for him; in the event this began with an announce­ment by the panel of adjudicators in Vienna that the composer was to receive a stipend of four hundred Gulden for several successive years. Among the judges were the critic Eduard Hanslick, a native of Prague, and, crucially, Johannes Brahms. Brahms saw much in Dvorák which was a reflection of himself. In order to reward the Czech composer he had to digest much detectably Wagnerian work, knowing already that the path of Liszt and Wagner was never to be his own. The irony of this is that in Wolf’s eyes Dvorák was damnable by association with Brahms, whom Wolf aesthetically despised. Had he reacted purely as a musician he would doubtless have found that he himself and Dvorák had not always been so very apart. As a North German Protestant devoid of religious con­viction, Brahms the solitary bachelor presents contrasts also with Dvorák, the pious Catholic enjoying the begin­nings of a full family life (though he endured tragedy also: the first three of his nine children had died in infancy by the time the fourth was born in 1878). The meeting of the two composers in Vienna in 1878 marked the beginning of a friendship lasting until Brahms’s death in 1897 and it was through Brahms that Dvorák obtained his opening with Simrock. His self-confidence had blossomed and he had won a further award with his String Quintet in G major, already half-written at the time of his Vienna application. 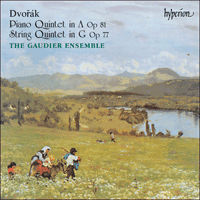 Many milestones were to be passed before the composition of Dvorák’s Piano Quintet in A major, Opus 81. His Fifth Symphony (Opus 24, but published in typically cavalier fashion by Simrock as Opus 76 thirteen years later) appeared in 1875, having been written in under five weeks during June and July. Revised in 1877, it represented a major advance beyond its predecessor in individuality and nationalist spirit (the inspired principal theme of its Scherzo finds a natural counterpart in the corresponding movement of the Piano Quintet). The orchestral Sym­phonic Variations of 1877 constituted an assured master­piece, albeit one not fully acknowledged until Hans Richter’s performance ten years later. The immediate and lasting success of the first set of Slavonic Dances followed in 1878, further impressing Brahms, and Dvorák now found himself the object of close attention from Simrock, who had spotted a good commercial opening in them and began to press him for simple marketable ventures in the same vein. Chamber music continued to pour from him. His Sextet in A major, that much-visited key, became his first work to be heard abroad before receiving a Czech performance. The Sixth Symphony was successfully performed in New York in 1883. In March the following year a visit to England established a lasting bond between the composer and an enthusiastic new-found public, and in April 1885 the Seventh Symphony in D minor was given its first performance at St James’s Hall, London. Despite the greater fame of the Ninth Symphony many regard the Seventh as the pinnacle of the composer’s output, and there can be no doubt that it maintains a supreme level of spontaneous inspiration throughout; never more so than in the splendid Scherzo movement’s seamless manipu­lation of opposing rhythmic divisions, which conjures prolonged and fascinating ambiguities without ever becoming congested. The emergence of Dvorák’s full and hard-won mastery followed directly upon Smetana’s richest compositional period, which by general consent lasted from the creation of The Bartered Bride to 1874. In that year overwork and incipient deafness overtook him. Although he struggled courageously, his health deteriorated over a decade during which composition became a progressive ordeal. He died in the National Asylum for the Insane, a bare six weeks after the first return from London of the younger com­poser whose early orchestral efforts he had assisted and to whom he had in effect passed the torch of Czech musical nationalism. ‘We Czechs are a singing folk’, he had once declared, and few composers have been more consistently singable in their instrumental conceptions than Dvorák. For this reason his large chamber output constitutes a particularly reliable barometer of change and development throughout his career. The Piano Quintet which he com­posed in 1887 is arguably the jewel amongst the chamber works which include a piano part, along with the expansive F minor Piano Trio, Opus 65. In December 1882 Dvorák’s mother had died at Kladno, near Zlonice. Whether explicitly or not, the F minor Piano Trio composed during the first months of 1883 must surely betray some emotional reaction on the part of a man whose eventual success had merely quickened an instinctive cherishing of his family and village roots. As Clapham justly says in his biography, the Trio ‘… reveals for the first time the depth of feeling and the dramatic power of which he was capable’. Its heroic first movement is more closely related to Brahms than most of his chamber music and is balanced by a slow movement of memorable poignancy. One of the latter’s most exquisite moments of pathos (in the remote key of B major) is a violin melody consisting of a rising octave followed by a downward scale and a final articulation of the descending B major triad. Not only have the octave leap and ensuing descent been noted in the finale of the G major String Quintet, but these are also the basis of the A major Piano Quintet’s opening cello solo (this time beginning on the fifth of the scale, with the tonic note heard first in the harmonic bass). Temperamentally Dvorák could well have uttered Carl Nielsen’s aphorism, ‘Music is the sound of life’, and in his case one may be more than usually ready to attribute melodic cross-reference to subliminal revisiting of his past—although, as it happens, this melodic prototype appears elsewhere, including the slow movement’s main theme in the famous Cello Concerto in B minor, Opus 104. The development concentrates upon the first subject and ensuing transition, generating a variety of sequential processes through string ‘discussion’ of the theme’s opening three bars. In Tovey’s opinion Dvorák never came to grasp the distinction between exposition and develop­ment: a partially accurate assessment, not necessarily critical, which might apply equally to Brahms. If this view seems harsh one should remember that wondrous lyricism in an exposition is by its very nature likely to be fully formed, and a ‘development’ consequently thrown back principally upon ‘verbatim’ repetition of fragments, rather than upon evolution and metamorphosis, is not only to be expected but also welcomed (without it the problem must surely recur with interest in the recapitu­la­tion). Though locally and fleetingly used, these modulatory sequences may harbour the ghost of Schubert, who in such works as his E flat Piano Trio (D929) effects a sense of slow tonal evolution through successive transposed repetitions of a long modulating paragraph. In common with the G major String Quintet’s first move­ment, that of the Piano Quintet truncates the recapitu­lation of the main subject, allowing space and licence for expanded free lyricism in the coda. Though triumphant, the peroration maintains a firm hold on the subdominant minor chord, thus embracing the ambi­valence of the opening theme until the final three bars. The slow movement introduces us to a title often to be found among Dvorák’s works (in its plural form it provides the popular subtitle to his Piano Trio, Opus 90, a work which abandons received Classical forms in favour of a wholly Slavonic aesthetic). ‘Dumka’ figures in a number of Slavonic tongues. Originally connoting an elegiac poetic convention, it obtained musical associations within the nineteenth-century Ukrainian ballad tradition. In a note written on the ‘Dumky’ Trio (Eulenberg, 1973) Roger Fiske tells us that ‘Dumky were never dances. There was a tendency for such music to inhabit changing moods, but it seems to have been Dvorák himself who, by exaggerating this characteristic, established as the dumka’s most striking feature the alternation of slow and fast sections, melancholy and ebullient’; the original dumka had evoked ‘meditation and reminiscence’. The ‘furiant’, unlike the dumka, is a dance type and specifically Bohemian. A paired Dumka and Furiant for solo piano which Dvorák wrote as his Opus 12 give an indication of the generic differences, Dumka being a con­templative mood piece in C minor and Furiant a headlong rush in triple time featuring many rhythmic displace­ments and sleights of hand. Examples of a more sophis­ticated virtuoso cast can be found among the challenging, largely neglected solo piano output of Smetana, which features many startlingly modern conceptions. Dvorák’s Scherzo in the Quintet is subtitled ‘Furiant’. It returns to A major, starting without preamble and presenting a disarming eight-bar melody for the first violin above string accompaniment. This is answered by the piano. A move to the mediant brings a minor variant of the melody before it is reinstated in A, accompanied on the piano by rhythms reminiscent of the Ländler style of Schubert which have already been heard from the strings. A new idea stated by the viola over static tonic harmony leads to the key of C and thence, improbably, to F sharp major (the hushed quintuplets from the piano providing an authentic ambience of folk improvisation around the theme). Restatement of the opening material brings a cadence followed by a quiet central section in F major where fleeting references to the opening melody come and go above a sustained chordal texture with the beguiling character of a lullaby. As this progresses it acquires a quasi-liturgical atmosphere, perhaps harking back again to village beginnings and the timeless union of folk music making and religious observance. The recapitulation, however, sweeps all introspection aside. The extended finale is dance-like, this time after the manner of a ‘galop’ or ‘polka’ (the latter again occurring in some notably frenetic guises amongst Smetana’s piano music). One is put in mind not only of dancers, but also of rustic instrumentalists and the instinctive virtuosity which enables their kind to ‘skirmish’—to try to outdo one another in an atmosphere of humorous mutual respect. The appeal of such a movement is so obvious that fustian analysis of its content almost goes against the spirit in which it was written—a point missed by many who find their academic preconceptions of Dvorák frustrated. A few brief comments will suffice. The introductory motif is put to prominent use even though it proves not to be the main theme. Accentuation of off-beat quavers is much in evidence, as is the piano, which falls silent only for one brief stretch midway through the movement. When that happens it is for the good reason that a fugato has broken out as a consequence of development of the opening motif and principal theme—much of this bearing detectable resemblance to subsidiary passages in the Scherzo of the Opus 34 Piano Quintet by Brahms (which appeared in that guise in 1865 after much perplexity as to its ideal medium). Dvorák was not naturally adept at imitative counterpoint, nor—as a self-styled student of the Classical tradition—did he often require it. Nonetheless this passage is effective both per se and in its marriage of an academic resource to distinctly un-academic material without detriment to the latter: a sure sign of inspiration flowing unchecked. After a hectic climax a more restrained (but still mobile) passage provides respite. Despite further climactic moments an air of deeper nostalgia begins to prevail. Twice a chordal passage is heard, first beneath the rhythmic flow of more agile material and later as an overtly melancholy shadow upon the face of this sunny music. The effect is again liturgical, again retrospective in terms both of intrin­sic drama and of human experience—until another precipitate dash hastens the final bars. The success of the Piano Quintet rests as much as anything upon its happy reconciliation of forces. Dvorák was a merely dutiful organist and a competent, tonally sensitive pianist who nonetheless had little intuitive or innate flair as a composer for the instrument’s idiomatic fluidity, just as he was also uneasy with its pyrotechnics. As such he can appear stilted in the early Trios and in the Piano Quartets, where the smaller string complement increases the need for pianistic weight at moments of rhetorical force. In the Quintet, however, we move beyond that sense of objectively ‘safe’ formulae externally and circum­spectly applied: the creative flow now seems entirely at one with the means found to express it. The piano, as if no longer oppressively required to conform to ‘academic’ perception of what is idiomatic, ceases to cultivate dutiful affects of texture and physical movement. The result is a Quintet of five largely consistent equals operating in harmonious unity and balance. Further success was to come to Dvorák, particularly in America, whither he set sail in September 1892 with his wife and two of their six surviving children in order to take up the Directorship of the National Conservatory of Music in New York. This belongs to another essay, but it is worth saying that the widespread view of Dvorák as an interested predator who seized upon ethnic American traditions to fashion would-be American art music of his own is wholly misplaced. True, American Indian and other traditions interested him deeply; but it was their very similarities to his indigenous equivalents that fascinated him. What a gratified American public may have been only too ready to accept as cultural diplomacy by Dvorák in his ‘American’ quartets and symphonies was largely fortuitous, imagined, or both. America aside, much of Dvorák’s remaining free time was to be spent at the country cottage which he had built at Vysocká on his brother-in-law’s estate. One of life’s more improbable pigeon-fanciers, he lovingly reared the creatures at Vysocká. In his years as Professor at the Prague Conservatory from 1891 (interrupted by absence in America, 1892–5) he indulged another passion, this time for steam trains (one shared by the composers E J Moeran and Arthur Honegger). These he would view at the yards before going to his work. His future son-in-law, the composer Josef Suk (1874–1935), once received a fear­some carpeting after going on an errand to ‘spot’ a train and inadvertently noting down the number of the tender, not the locomotive: ‘So that is the kind of man you wish to marry!’ exclaimed the wrathful professor to his daughter. It has been aptly remarked that, with Dvorák, laughter and tears are seldom far apart. Few composers came into the world with so little material chance of success, deve­loped so late and lived, as he did, to taste international acclaim, gratitude and affection (he was a man who inspired that). Unchanged by all this, he remained piously grateful even while, it seems, a part of him yearned the more strongly for the little inn at Nelahozeves. There he would always be a local man who could usefully hold down a string part at times of festivity. In his most boisterous moments we should still be ready to catch him standing momentarily back from his own being, the man among convivial company who suddenly imagines himself gazing in from without. These moments can have about them the quality of prayer, and are evident in the slow music of the Opus 77 Quintet just as they are with lengthening retro­spection in the late works. No further evidence of his humble simplicity of spirit is needed than his own endearing claim that he had ‘studied with the birds, the flowers, the trees, God and myself’. L’aîné d’une famille de huit enfants, Antonín Dvorák est né le 8 septembre 1841 et n’avait pas encore dix ans lorsqu’il commença à prendre des cours de violon à l’école du village; on sait toutefois peu de choses sur son évolution à cette époque. L’allemand étant la langue officielle de Hapsburg, ne pas le parler constituait un handicap professionnel majeur et Antonín fut donc envoyé à Zlonice en 1853 où il logea chez son oncle maternel et où Antonín Liehmann, musicien amateur compétent et organiste local lui dispensa une éducation à la fois linguistique et musicale. Il semble que l’allemand fut négligé au profit de l’harmonie, la basse chiffrée, le piano, l’orgue, le violon et plus particulièrement l’alto qui devait plus tard demeurer l’instrument préféré du compositeur. L’intention de Liehmann de faire étudier le jeune Antonín à Prague fut d’abord rejetée par le père de celui-ci pour des raisons financières très compréhensibles, mais il finit par céder et Antonín put entrer à l’école d’organistes en septembre 1857. Bien qu’il fut deuxième sur douze lors de sa seconde année, ses bulletins indiquent qu’il semblait plus intéressé par la «technique et les connaissances pratiques», sou­lignant implicitement le mot «pratique» comme pour diminuer son mérite. L’auteur du bulletin concluait avec dédain que l’élève était «faible en théorie». Ainsi, nous avons devant nous en ces derniers mois de 1859 un jeune homme de dix-huit ans, apparemment sans moyens de subsistance, considéré faible en ce qui concerne les aspects techniques de la composition et ne possédant quasiment aucun bagage sur le plan du travail et de l’expérimentation. De 1859 à 1871, il allait connaître une période d’intense et opiniâtre autodiscipline, travail­lant en autodidacte, seul et avec acharnement. Se fixant comme modèles les maîtres classiques, repartant inlas­sablement à zéro, Dvorák écrivit d’immenses quantités de musique. Le compositeur novice s’assura malheureuse­ment l’indifférence des générations à venir pour ces douze années de travail en brûlant la quasi totalité de ce qu’il avait écrit. Ce qui fait l’intérêt et la valeur de l’opus 77, c’est cette évidente transition interne vers une expression mature d’un équilibre formel et du contenu thématique. Cette œuvre est attachante plus par l’atmosphère qui s’en dégage et par son mode d’expression que par les carac­téristiques de ses lignes mélodiques, bien que celles-ci n’aient rien de quelconque. Sa présentation au côté d’un chef-d’œuvre totalement épanoui n’en est que plus enrichissante. Le succès du Quintette avec piano no 2 en la majeur, opus 81, réside avant tout sur une heureuse réconciliation des moyens mis en œuvre. Dvorák n’était qu’un organiste consciencieux et compétent, un pianiste sensible aux tonalités de l’instrument, mais sans grande intuition ou talent inné en tant que compositeur pour la fluidité propre à cet instrument, de même qu’il n’était pas à son aise avec la superbe de cet instrument. Ainsi, il peut apparaître guindé dans les premiers trios et les quatuors avec piano dans lesquels le complément léger en cordes augmente le besoin de présence du piano dans les moments de force rhétorique. Dans le quintette cepen­dant, nous allons au-delà de cette formule objectivement «sûre» appliquée extérieurement et avec circonspection: le flux créatif semble ici faire entièrement corps avec les moyens mis en œuvre pour l’exprimer. Comme s’il n’était plus strictement utilisé de façon impérative pour se con­former à la perception académique de ce qui est idioma­tique, le piano cesse de cultiver les effets de texture et de mouve­ment physique décrits dans les manuels. Il en résulte un quintette dont les cinq composants sont égaux et se marient avec unité et harmonie. Il a été remarqué avec justesse que chez Dvorák, le rire et les larmes sont rarement loin l’un de l’autre. Peu de compositeurs sont ainsi venus au monde avec si peu de chances de succès, se sont accomplis si tardivement et ont vécu, comme il l’a fait, pour savourer la consécration internationale, la gratitude et l’affection (il était homme à inspirer de tels sentiments). Égal à lui-même malgré tout cela, il conserva une profonde gratitude alors qu’une partie de lui-même semblait aspirer à un retour dans cette petite auberge de Nelahozeves, où il serait toujours resté un homme du pays, un musicien ayant sa place au moment des festivités. À ses heures les plus agitées, on peut toujours se le représenter prenant momentanément du recul par rapport à sa propre personne, posant en pleine convivialité un regard extérieur sur lui-même. De tels moments peuvent se comparer à la prière et se retrouvent de façon évidente dans la lenteur du Quintette opus 77 avec cette longue rétrospection présente dans ses dernières œuvres. Il n’est pas besoin d’autre preuve de son humilité quand l’on considère sa touchante déclara­tion d’avoir «étudié avec les oiseaux, les fleurs, les arbres, Dieu et lui-même». Antonín Dvorák war am 8. September 1841 als ältestes von acht Kindern geboren. Noch bevor er seinen zehnten Geburtstag feierte, hatte er in der Dorfschule Geigenunterricht erhalten—allerdings ist über seine ersten Fortschritte wenig bekannt. Deutsch war derzeit die offizielle Landes­sprache der Habsburger und seine Unfähigkeit, sich in dieser Sprache auszudrücken, war ein wesentlicher Nachteil für seine Laufbahn. Daher wurde Antonín 1853 nach Zlonice geschickt, wo er bei einem Onkel mütter­licherseits wohnte, während er von dem fähigen Laien­musiker und Organisten Antonín Liehmann Sprach- und Musikunterricht erhalten sollte. Der Sprachunterricht scheint jedoch zugunsten von Harmonielehre, beziffertem Baß, Klavier, Orgel, Geige und besonders der Bratsche, dem späteren Lieblingsinstrument des Komponisten, vernachlässigt worden zu sein. Liehmanns Bemühungen, ihn in Prag studieren zu lassen, standen zunächst die Einwendung des älteren Dvoráks entgegen—aus recht vernünftigen finanziellen Gründen. Doch gab er nach und Antonín trat im September 1857 in die Orgelschule ein. Obwohl er als zweiter aus einer Gruppe von zwölf Schülern in seinem zweiten Jahr hervorging, besagte sein Zeugnis, daß „er sich vornehmlich mit praktischem Wissen und Fähigkeiten“ beschäftigte, wobei ein eher herabsetzender Schwerpunkt auf „praktisch“ gelegt worden zu sein scheint. „In der Theorie ist er schwach“, war der Entlassungsbemerk. Die Gestalt, die wir in den letzten Monaten des Jahres 1859 zu betrachten haben, ist die eines Achtzehnjährigen ohne sichtbares Einkommen, der in den technischen Aspekten der Komposition als mangelhaft angesehen wurde und durch freiwillige Bemühungen und Experi­men­tierfreudigkeit keine Lehrstelle erhalten konnte. Zwischen 1859 und 1871 folgte er einer intensiven und unerbittlichen Route aus Selbstdisziplin, Selbstunterricht und charakteristisch unauffälligem Eifer. Seine Vorbilder waren die klassischen Meister und unermüdlich fing er wieder von vorne an—Dvorák schrieb in dieser Zeit riesige Mengen an Musik. Doch der junge Komponist versicherte, daß spätere Generationen diese zwölf Jahre seines Schaffens mit fortdauernder Gleichgültigkeit betrachten würden, denn er verbrannte fast alles, was er geschrieben hatte. Interesse und Wert von „Opus 77“ liegen in seinem inneren Beweis für den Übergang zu einem reiferen Verständnis für formales Gleichgewicht und thematischen Inhalt. Keineswegs unbezeichnend, so ist es doch eher wegen seiner allgemeinen Atmosphäre und Ausdrucks­kraft interessant als wegen bestimmter Merkmale der melodischen Linien. Seine Anordnung hier neben einem ausgewachsenen Meisterwerk ist daher sehr aufschluß­reich. Der Erfolg des Klavierquintetts Nr. 2 in A-Dur, Opus 81, beruht nicht zuletzt auf einer geglückten Vereinigung von Kräften. Dvorák war ein pflichtbewußter Organist und kompetenter, tonempfindsamer Pianist, der dennoch wenig intuitives oder angeborenes Geschick als Komponist für die idiomatische Flüssigkeit und feuerwerkartigen Möglichkeiten dieses Instruments besaß. Daher erscheint er in den früheren Trios und Klavierquartetten, bei denen die kleinere Streichbesetzung in Momenten rhetorischer Kraft die Notwendigkeit pianistischen Gewichts verstärkt, oft steif und förmlich. In diesem Klavierquintett über­queren wir jedoch dieses Gefühl von äußerlich und wohlbedacht angebrachten, objektiv „sicheren“ Formeln: der kreative Fluß scheint jetzt vollkommen eins geworden zu sein mit den Mitteln, ihn auszudrücken. Als brauchte es nicht länger verbissen der „akademischen“ Auffassung von Idiomatik zu entsprechen, bemüht sich das Klavier nicht mehr pflichtbewußt um Wirkungen von Struktur und physischer Bewegung. Das Ergebnis ist ein Quintett aus fünf weitgehend gleichgestellten Teilen, die in harmon­ischer Einheit und Ausgewogenheit zusammen spielen. Es ist zutreffend bemerkt worden, daß bei Dvorák Lachen und Weinen nicht weit auseinander liegen. Nur wenige Komponisten wurden mit so wenig materiellen Aussichten auf Erfolg geboren, entwickelten sich so spät und erlebten wie er internationale Anerkennung, Dankbarkeit und Zuneigung (er war ein Mann, der dies hervorrief). Doch ungeachtet dieser Erfolge blieb Dvorák stets dankbar und bescheiden, auch wenn sich ein Teil von ihm scheinbar umsomehr nach dem kleinen Gasthaus in Nelahozeves sehnte. Dort war er immer der Einheimische, den man bei Festen und Feierlichkeiten heranziehen konnte, einen Streicherteil zu übernehmen. In seinen lebhafteren Augenblicken müßten wir ihn immer noch sehen können, wie er einen Moment lang aus sich selbst heraustritt—ein Mann in freundlicher Gesellschaft, der sich plötzlich vorstellt, er schaute von draußen herein. Diese Augenblicke können die Eigenschaft eines Gebets annehmen und zeigen sich in der langsamen Musik des Quintetts Opus 77 wie in den länger werdenden Rück­blicken seiner späteren Werke. Keines weiteren Beweises für diese bescheidene Einfachheit des Geistes bedarf es, als seine eigene liebenswerte Beschreibung, er habe „bei den Vögeln, den Blumen, den Bäumen, Gott und bei mir selbst gelernt“.